If anything can go wrong with your garage door, we can fix it. Our installers and repair technicians are trained to meet a high standards of excellence. Has your garage door has become the problem door in your home? If so, give us a call. We provide free estimates for your unexpected garage door issues. The products we use are top quality so that hopefully you won't need to see us again for a long time. Some of the brand names that we use for parts, openers and new doors are Northwest Door, Liftmaster and Genie to name a few. Get a Coupon and Save on Your Next Garage Door Repair. Broken torsion springs can be a huge concern for safety. Serious injury could result from novice attempts at replacing garage door springs without knowledge of potential dangers. Torsion springs can provide close to 10,000 open-close cycles before failure. For your safety and the safety of others, please contact us immediately when a spring breaks. Call us today at 253-922-6280 for a free estimate. Our trained tecnicians are dispatched to your location to provide with a free estimate, whether it's a wireless keypad, replacement spring, general safety issues or a new garage door. Emergency, out-of-area travel and after-hours service calls subject to a service charge. Customers particularly value the emphasis on work quality and expertise in fixing springs and silencing garage doors. Sumner Garage Door is a division of ASGD, LLC, a trusted name in the industry for over three decades, originally formed as All Service Garage Doors. We're a licened (#ASGDLL*817c1), bonded and insured family-owned business, operating locally since 1982. 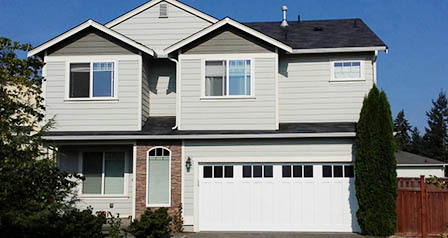 Your garage door is the largest door and biggest object requiring reliable movement in your home. A slow-moving or stuck garage door can affect your safety and compromise your ability to have adequate access. Sumner Garage Doors will provide you with the service excellence you expect. You can even get a discount on our services by using one of our on-line coupons. Look with confidence to Sumner Garage Doors for customer service excellence, quality work, quick response and affordable prices. Puyallup garage door repair, Tacoma garage door repair, Bonney Lake garage door repair, Buckley garage door repair, Auburn garage door repair, Gig Harbor garage door repair, University Place garage door repair, Spanaway garage door repair, Graham garage door repair, Lakewood garage door repair, DuPont garage door repair, Yelm garage door repair, Lacey garage door repair, Olympia garage door repair, Tumwater garage door repair, Centralia-Chehalis garage door repair and Tenino, Washington.